Property 11: This spacious houseboat is located on the "Wittenburgergracht"
Property 13: Cozy Houseboat on famous canal in Amsterdam, the place you want to be! Property 15: Houseboat In The Center, 5 min walk to Tropical Museum, Free Wifi! Property 16: Romantic houseboat in Amsterdam center! 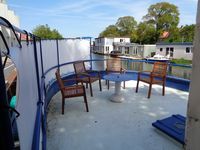 Property 26: Very nice spacious houseboat in the center of Amsterdam .Jordaan Area. Property 29: Bright & Spacious Studio @ eco houseboat! Property 30: Your Own Lovely Houseboat; Safe, Clean and Cosy! Property 34: The best way to stay in Amsterdam, on a big super luxury houseboat. Property 35: Central & Modern studio on Eco-Houseboat! Enjoyed our stay, nice quite area, the houseboat has lots of space, clean and well maintained. Very nice owner. We really enjoyed our time on the boat. The location is fantastic, peacefully on the Amstel away from the tourist crowds yet a block from a Metro stop that quickly brings you anywhere you need to go in the city. My only minor complaints are that the oven is really confusing. Also, the bathroom downstairs is a &quot;Jack and Jill&quot; set up which may annoy some, but it didn't bother us.